HABIT: Unique shrub with vertical stems, thick spiny leaves, yellow early spring flowers, and blue berries following. Tends to get leggy, but that gives it the dramatic character. Native to China. CULTURE: Easy to grow. Best in prepared beds in shade. Moderate water and food requirements.Remove one-third of the canes per year, if a bushier effect is desired. USES: Accent, distinctive foliage and character and good for Oriental gardens. 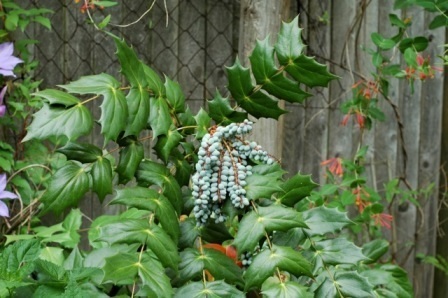 NOTES: The closely kin Oregon grape M. aquifolim is unsuccessful here despite what you may have heard. It needs a cooler climate such as its native home, the Pacific Northwest.